U.S. equity index futures were higher this morning. S&P 500 futures were up 11 points in pre-opening trade. Strength was prompted by a 2.39% gain by the Shanghai Composite Index to 3.253.60. 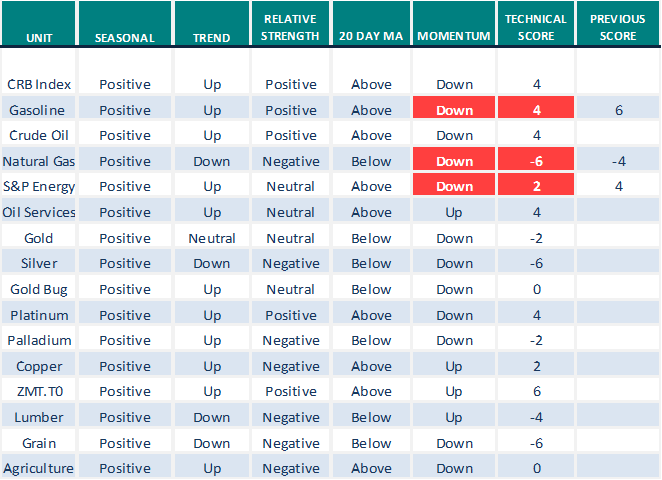 Several North American equity indices are testing their all-time highs this morning. 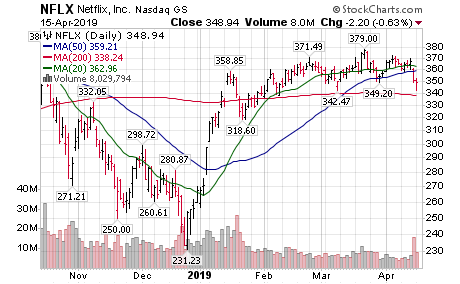 All-time highs are 2,940.91 for the S&P 500 Index, 8,133.30 for the NASDAQ Composite Index, 7,700.56 for the NASDAQ 100 Index and 16,586.26 for the TSX Composite Index. 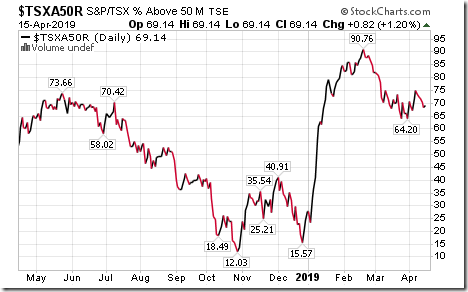 The TSX 60 Index broke to an all-time high yesterday. 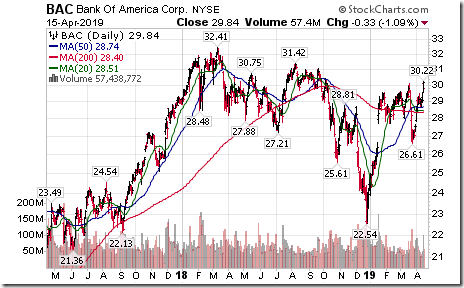 Bank of America (BAC $29.84) is expected to open higher after reporting higher than consensus first quarter sales and earnings. UnitedHealth Group (UNH $230.20) is expected to open higher after reporting higher than consensus first quarter sales and earnings. The company also raised guidance for 2019. 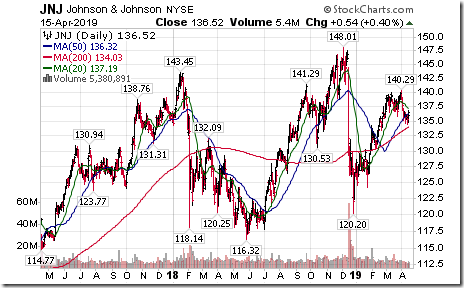 Johnson & Johnson tacked on $2.50 to $176.52 after reporting higher than consensus first quarter sales and earnings. The company also raised guidance for 2019. 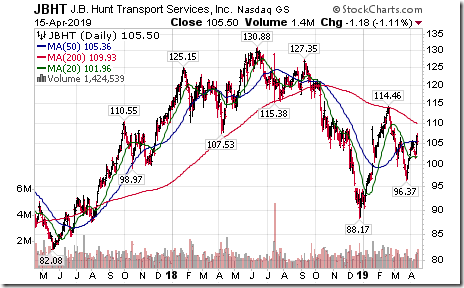 JB Hunt Transport (JBHT $105.50) is expected to open lower after reporting lower than consensus first quarter sales and earnings. 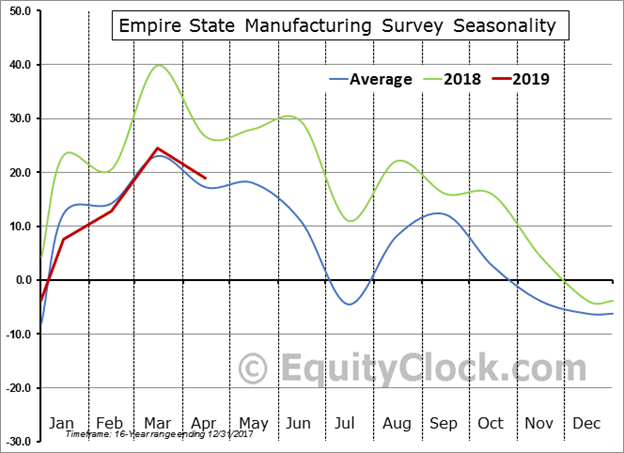 Note seasonality chart on the Empire State Manufacturing Survey. Editor’s Note: After 10:00 AM EDT, intermediate breakouts included ICE, SO, PEP and K. No breakdowns. 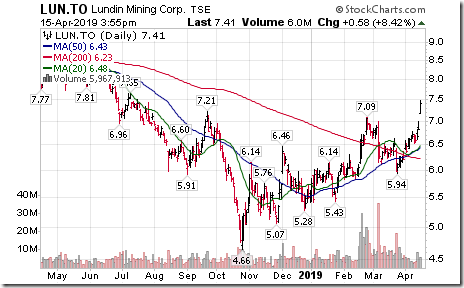 Another base metal stock breakout! 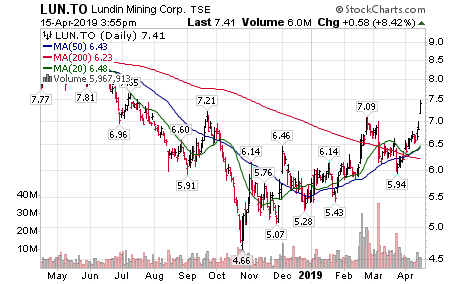 Lundin Mining $LUN.CA moved above $7.09 extending an intermediate uptrend. 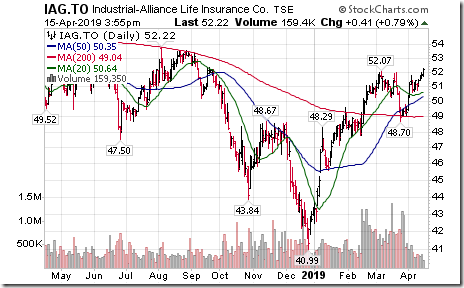 Industrial Alliance $IAG.CA moved above $52.07 extending an intermediate uptrend. The Barometer dropped 3.21 to 80.76 yesterday. It remains intermediate overbought. Barometer added 0.82 to 69.14 yesterday. It remains intermediate overbought. BAC Record Profits! 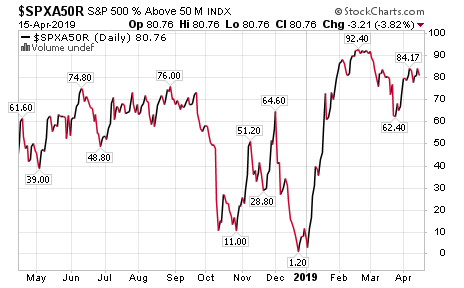 – “Economic growth and consumer activity in the U.S. continue to be solid, businesses of every size are borrowing and driving the economy, and asset quality is strong,” Moynihan said in the release. 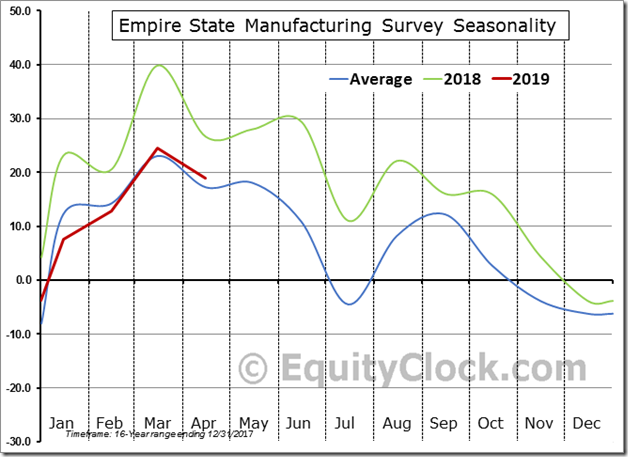 Where is David Rosenberg with his recession bogeyman? Re 3 – Thanks Rick. 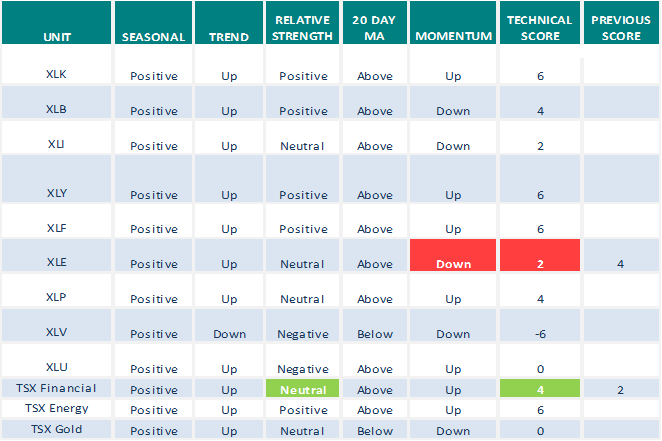 Does better on the upside and drops more on the downside. SOXX is strong today. I continue to love FDX. New all time highs – QQQ, XIC (I believe the old high was 26.34 and we hit 26.35 today). Now and again Stockcharts reminds me that I’ve saved the maximum 500 charts and must delete some before I can save anymore. So I go through them all looking for charts that I don’t need to keep anymore. I’ve found so many over the years that were “Belle of the Ball” stocks that crashed and burned and no one mentions them anymore and delete them. Here is one that I’ve kept as a reminder not to believe all the “stories” you read about. 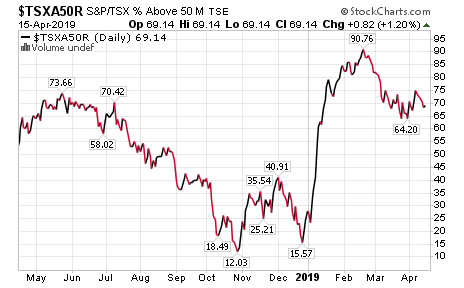 Recall CPG.to Crescent Point Energy that hit roughly $38 on the $TSX and in 5 years fell to three bucks. 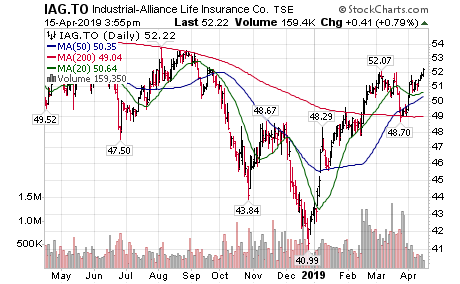 This stock was highly recommended by various brand named analysts on BNN etc every time I turned on the station. I always wonder just how many people own these stocks with little value anymore. Another super Belle of the Ball stock that was supposed to be Canada’s Apple Computer:BB.to,Blackberry. Everyone owned and loved this one almost as much as Nortel. 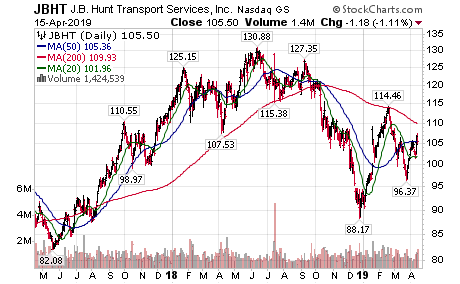 The point is there are always bullish stock stories told but you don’t have to drink the cool-aid and should think for yourself before buying and holding stocks that end up looking like this. I’ve deleted dozens of stocks with charts like this and will continue to delete them as they plunge in value. Some of the best advice I ever got was, “before” you buy a stock write down the price you would sell it for if you are incorrect on its direction. And don’t rationalize when it reaches that price. Small losses wont wipe you out like holding onto stocks like these will. 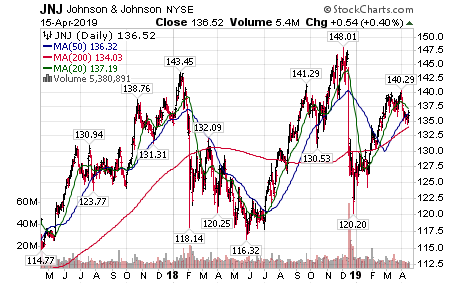 Re 5 Ron/BC – I didn’t own Nortel but after that stock I can’t listen to a particular Beatles song anymore if you remember the commercial they used to flog that stock. Thanks for your words of caution yesterday. 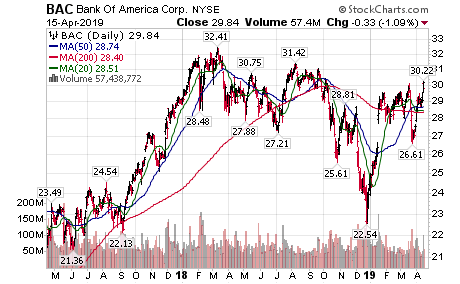 The way the Cdn banks are going right now the shorts are getting hammered. 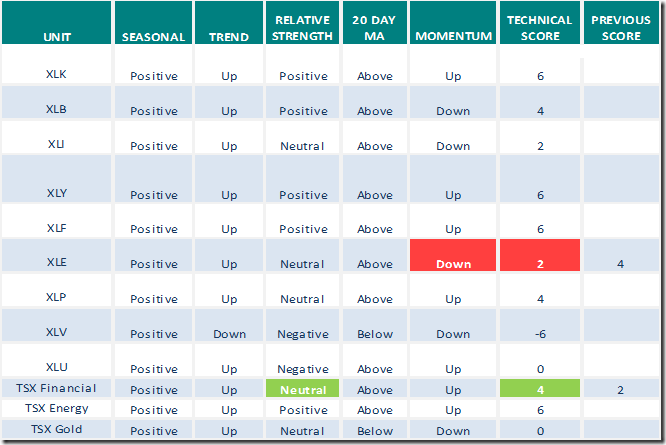 do not invest in stocks , invest in a stock index . A simple chart of big US indexes will show us that all of them are up in last 16 years . Re Banks. The experts say the banks can’t make money with inverted yield curves or a narrow spread between the bond rates. But as always “Price is King” and the only thing that will really make prices rise is more buyers than sellers collectively and for a selloff you need more sellers than buyers collectively. 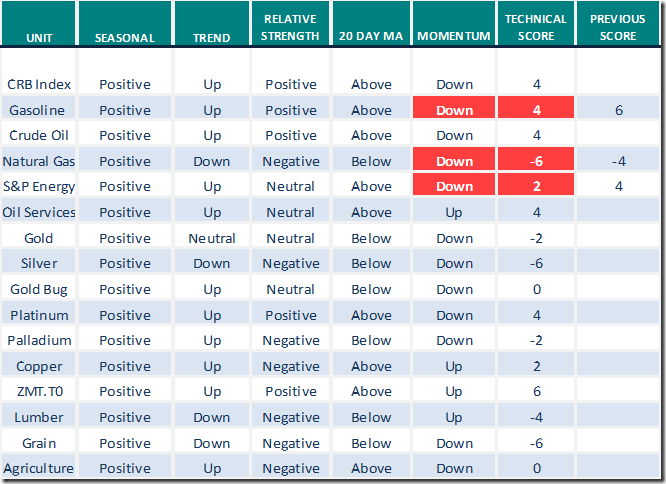 So much for fundamentals……. Agree,there is far less risk investing in an Index ETF as there is not just the high quality but the strength in numbers. Any one stock within the Index wont trash your investment regardless of what happens to one or two of them. So when some hot shot investment firm downgrades a stock they’ve sold and shorted it wont kill the Index ETF. 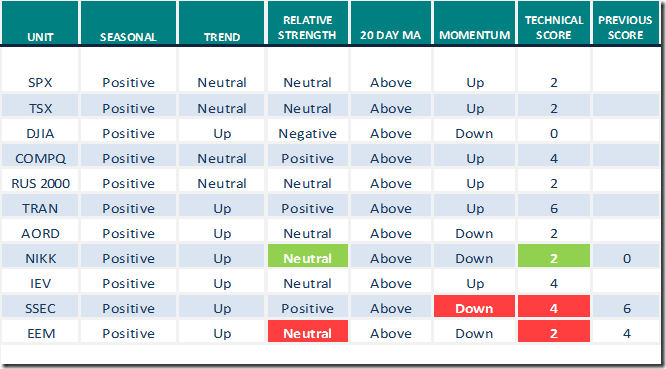 Large Money Flow Out of REITS – XRE, IYR. As a defensive name BCE is down marginally. 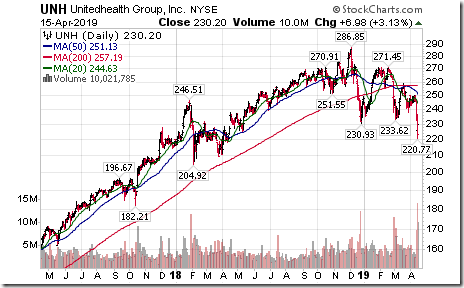 Health care getting hammered – XLV. Looks like flow going out of defensives and into growth. Anything not performing should be culled. We can apply the same principle (stocks versus index of stocks ) when we invest in real estate. I can see investing in the IYR or XRE.to with investment money but it would never match the actual dollars made in buying and selling a house or condo on the West Coast or other normally strong real estate market. My condo I bought last May is renovated now and a realtor told me they would list it for $60K more than I have invested in it. I don’t know how many shares of IYR or XRE.to I would need to buy to make that much money in the same time frame or even longer and without being taxed on the profit but it would be a lot of money I would guess. Haven’t done the math but I would guess it would be difficult. Here are the two REIT ETFs and they have an impressive track record. 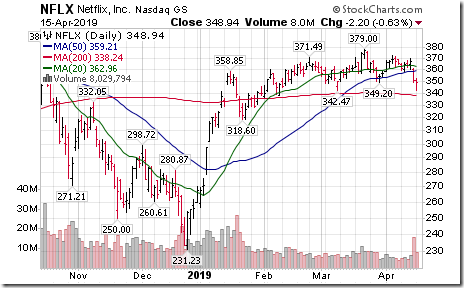 I will watch the charts for an opportunity to trade them in the future. Euphoric levels at an all time high, especially here on the blog. 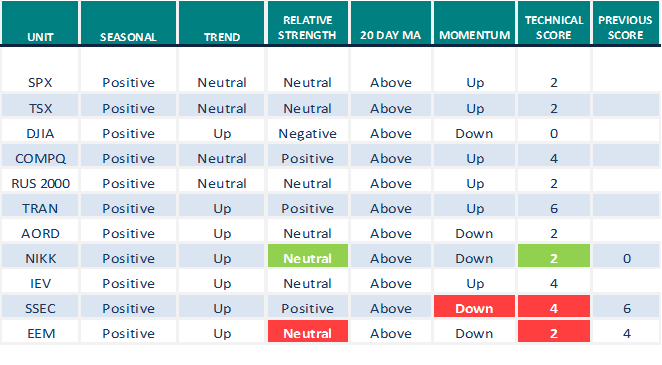 Day trading charts ready for a pull back. On another side note, Alberta Elections results in a few hours! A bit anxious. A great day for Alberta. No more mamby pamby………….. This about sums up what the next 4 years under Kenney will be like for Alberta. Toss in a dose of homophobia, misogyny, racism, and white supremacy plus an investigation into Kenney’s leadership campaign by the RCMP and it will be an interesting 4 years. People complain about “socialistic” policies by the NDP, however the UCP are just hoping to give corporations their socialistic assistance. Ha, what a hypocrisy.